It is a system that captures the suns solar radiation to heat water. Solar radiant heat is an energy that is emitted by the sun and which flows equally in all directions from it. This means that solar energy doesn't cost you anything, as it's free renewable energy. A system with efficient solar collectors and matching system components can save you approximately 50 - 60% of your annual energy demands for domestic hot water heaters (DHW). 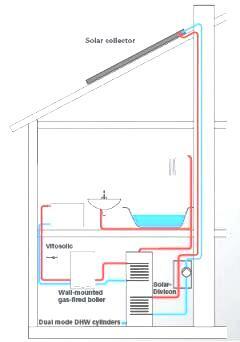 There are two types of solar-heating systems, 'thermosyphon' and 'pumped'. 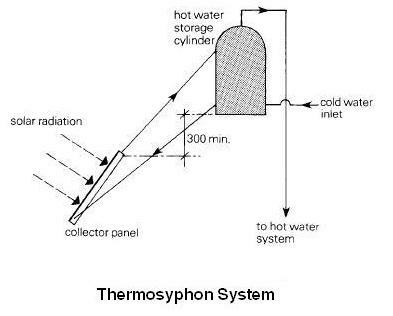 In the thermosyphon system, you have a storage tank which is placed above the collector. As the water in the collector is heated, it will rise naturally and start to circulate around the tank. This action draws colder water in from the bottom of the tank which makes this system 'self-regulating' as it requires no moving parts nor any external energy. A drawback with this type is the need for the tank to be placed at a level higher than the collector, which is sometimes not possible. 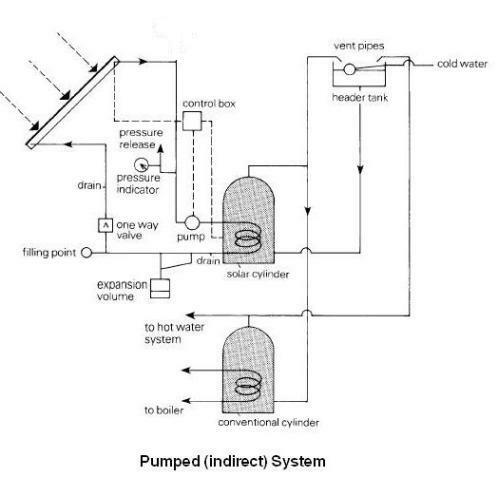 The pumped system uses a pump to circulate the water, so your hot water storage cylinder is positioned independently of the collector location. The pump however requires energy to run but this can be solar as well. 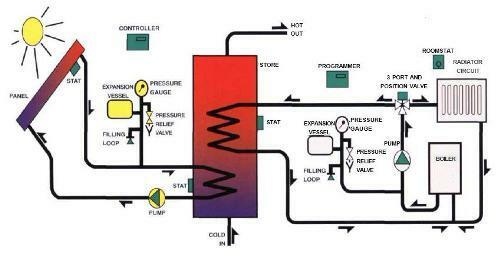 Systems using solar electric pumping and controls are known as zero carbon solar heating systems, while systems using mains electricity are known as low carbon systems. 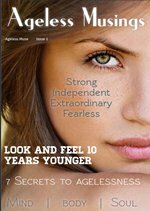 How Can I Save So Much On My Domestic Hot Water Bills? Simply because during the summer months an efficient solar-heating system can cover almost all of your domestic hot water (DHW) requirements. In the transitional months with low-level sunlight (spring and autumn) the solar heating can be used to preheat your DHW and/or preheat underfloor and radiator heating system, again reducing costs especially if using a boiler capable of low temperatures such as a condensing boiler. Annual running costs and carbon dioxide (CO2) emissions can further be reduced if you use a thermal energy heating (ground source heat pumps) or hot water heat pump as your heat generator instead of a boiler that uses fossil fuel like gas, or oil. Are Solar Collectors Only Installed on Pitched Roofs? Note: The increased use of renewable energy means a reduction in carbon dioxide (CO2) emissions which is better for our environment. There are some integrated solar systems available that have a pre-assembled storage unit with integrated solar control and pump. These systems are designed to reduce installation time and cost, and take up less installation space. Solar energy water heaters is not just a conscientious purchase for the environment, it has more benefits like Saving energy bills,increased hot water. Increase your home value by installing a Solar energy water heater.